Paper Pawz: New Baby Onesie Card! Happy Friday crafty friends! Doing a happy dance because I have no office commitments this weekend! 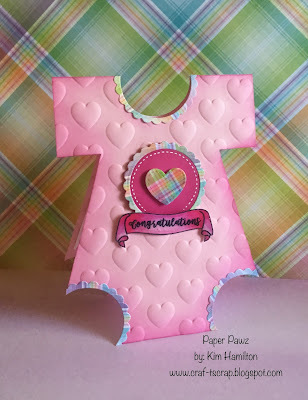 I saw this great tutorial on Pinterest to make a baby onesie card. I just had to try it! Perfect timing, lots of births in my little world this year. I had such fun making this card and once you have your measurements, it is so easy to do! I started with my new Lawn Fawn Ballet Slippers card stock cut to an A2 size card (4.25 x 5.5). Then it's simply a question of using either a round punch or die (I used my Lawn Fawn dies, both the stitched circles and scalloped circles). I then measured the sides and cut them with my Tim Holtz scissors and added a bight of Picked Raspberry Distress Ink on the edges. I thought the We R Memory Keepers Next Level embossing folders with the puffy hearts would be sweet so I embossed the card base. 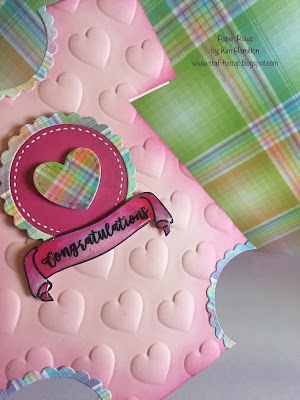 I then cut the scalloped edges and the heart die with some Lawn Fawn Rainbow Plaid paper. I added a hot pink circle to frame the heart and the congratulations sentiment is by Avery Elle. On the inside I cut a white "onesie" to write my message. Simple and fun project!